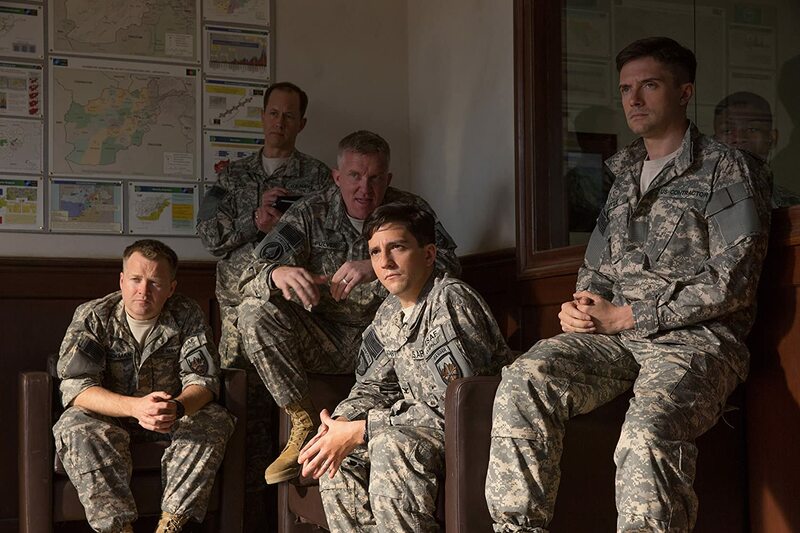 Writer-director David Michôd (Animal Kingdom) recreates a U.S. General’s roller-coaster rise and fall as part reality, part savage parody – raising the specter of just where the line between them lies today. His is an exploration of a born leader’s ultra-confident march right into the dark heart of folly. At the story’s core is Brad Pitt’s sly take on a successful, charismatic four-star general who leapt in like a rock star to command NATO forces in Afghanistan, only to be taken down by a journalist’s no-holds-barred exposé. 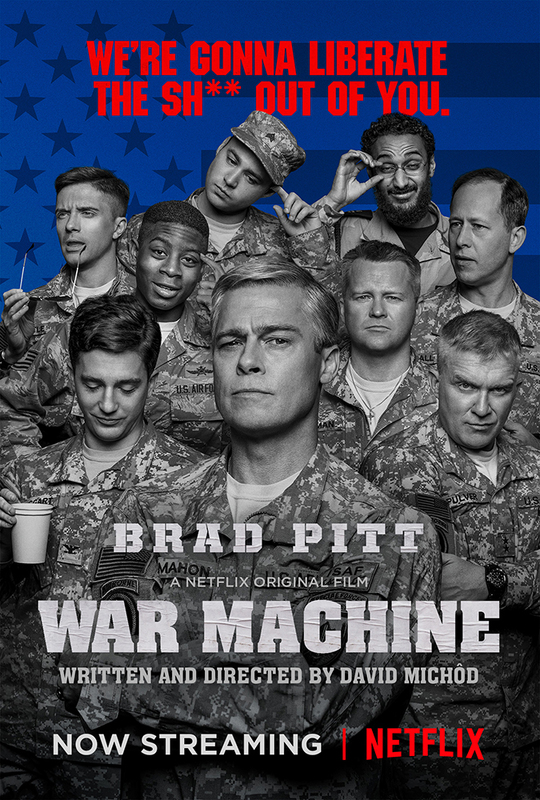 A Netflix exclusive, War Machine boasts an ensemble of familiar faces with Brad Pitt leading the pack. Rarely compelling and tonally inconsistent, the film teeters on a satirical approach while often being bogged down by moments of fraudulent drama. Never developing any stakes or real urgency, it lacks any story structure. War Machine consists of wisecracking men sitting around waiting for something to happen, ironically that could be said for the viewers as well, patiently waiting for anything to happen. The two hour runtime can be felt by the one hour mark as little development is made. General McMahon and his squad bounce from place to place, waiting for events to happen. It becomes tedious when we constantly see these other actors and their talents going to waste as they hide behind Pitt’s character. Though the film is littered with talented actors, most of them are dumbed down to caricatures that can be seen in every war related film, satirical or drama. They start by introducing McMahon and his crew which is overlong and leads to nothing as these characters are sidelined for the duration of the film. Esteemed actors such as Ben Kingsley and Tilda Swinton come and go without leaving any kind of lasting impression. Topher Grace and Anthony Michael Hall are among the crew members who have one specific character trait and are tasked with lines of unnecessary exposition that doesn’t progress the story. One standout of the supporting cast is LaKeith Stanfield who keeps showing up in movies and delivering nuanced performances, whether it be Short Term 12, Dope, or Get Out. Brad Pitt’s performance as the head honcho is a mixed bag. He’s given enough to work with and has character depth but his portrayal seems almost like a parody of his roles in Inglorious Basterds and Fury. He often seems like he is refusing to exhale in an effort to deliver lines of gravel while standing tall and big chested. His usual onscreen charisma isn’t seen often enough, instead we’re gifted with many shots of McMahon and his awkward duck walk. You could make the argument that Pitt is miscast here and that they would have benefitted from an older, grittier character actor. Of course with Pitt being one of the producers we understand why he got the gig. War Machine isn’t necessarily a good film but could still be worth a watch thanks to the star status of Pitt. With little story progression, we never understand the intentions and decisions of the characters. Squandering any chance to be a memorable satire with its uninteresting characters, drab cinematography, and shortage of edginess. Less a war film, more a character study of a flawed, stereotypical leader, War Machine is a phony portrayal of the US’s involvement in Afghanistan.